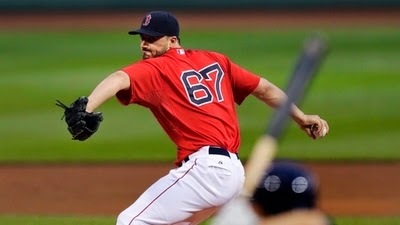 Brandon Workman (0-0, 3.24 ERA) will look to silence the outside noise as he tries to get the Red Sox back on track against the Cleveland Indians tonight. MLB handed down the punishment yesterday, and Workman was quick to appeal the decision, making him eligible for tonight's game against Cleveland. The Red Sox will look to get back on track after falling behind early in the previous 2 games against Cleveland, and Workman will need to be at his best to prevent another early hole. The good news for the Sox is the offense didn't wait around as long last night as it did Monday to get going, but they face a tough challenge in Indians starter Corey Kluber (6-3, 3.09), who has been on fire as of late. In 6 starts during the month of May, he posted a 2.09 ERA, not allowing more than 3 runs and lasting at least 6 2/3 innings in all 6 starts. He also joined one Yu Darvish as the only pitchers with 60 strikeouts in a single month in the last 10 seasons. Ex-Red Sox and NESN analyst Dennis Eckersley was the last to do it in 1976, when he was with Cleveland. The outlook is bleak, to say the least, but that's what the Sox are dealing with if they want to overcome this 2 game skid and get back to winning ways. Daniel Nava will get the start in left field ahead of Jonny Gomes while Stephen Drew is at shortstop for the 3rd straight game and batting 7th.